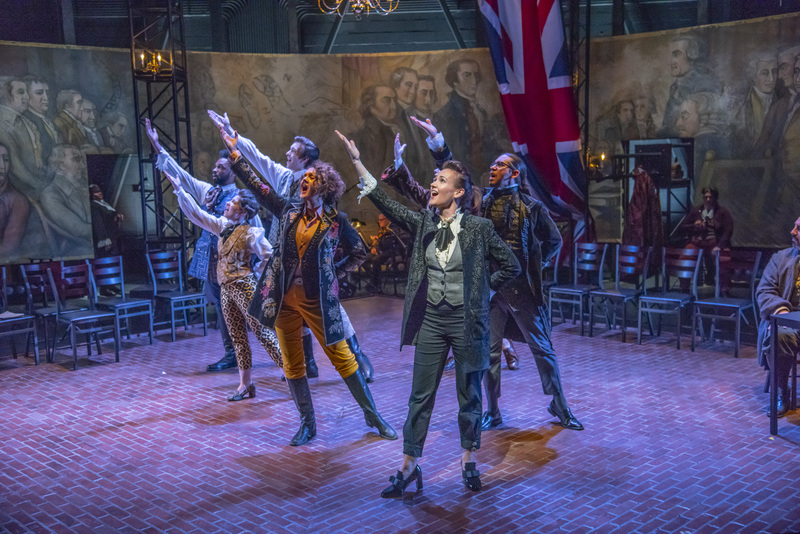 Given the makeup of the Continental Congress, diversity was not part of the original Broadway production in 1969, with 21 roles performed by 19 white men and two white women. In recent years, perhaps spurred by the success of “Hamilton,” theater companies have been finding ways to change that. The program for this production notes the 2014 all-female production in San Jose, Calif., and in 2016 an Encores! City Center revival that featured a racially diverse cast in modern dress. 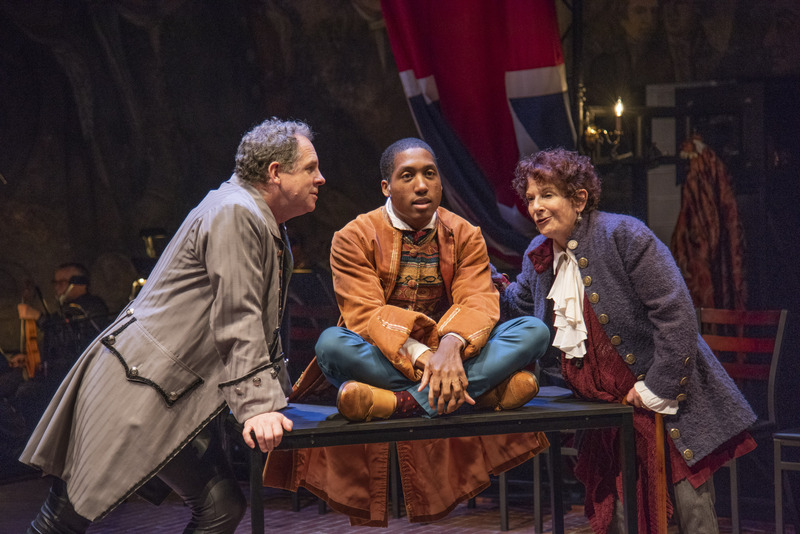 For this run, co-directors Austin Pendleton and Kelli Edwards have taken it a bit further, first casting a wide palette of black, brown and yellow faces, but also employing 10 women in roles traditionally ;played by men and a male, Dan Prior, as Martha Jefferson. Non-traditional casting or not, cross-gender casting or not, the actor or actress has the obligation to inhabit the character and effectively portray him/her. In this case, some succeeded and some didn’t. “1776” is the backstory of the signing the Declaration of Independence in the weeks before July 4, 1776, when the document was finally signed. And when Adams gets out of line, who better to rein him than Dr. Benjamin Franklin? The accomplished actress Bobbie Steinbach has previous experience playing strong male characters, in the role of Cassius last January in Actors’ Shakespeare Project’s all-female “Julius Caesar,” and she delivers Franklin’s bon mots with great gusto. With African-American actor KP Powell portraying Thomas Jefferson, there is perhaps an additional layer of irony as he unsuccessfully argues to keep the ban on slavery out of the final version of the Declaration. There’s some fine work in supporting roles, too. Liliane Klein is just right as Delaware’s blustery Scot, Col. Thomas McKean, as is Gary Thomas Ng as the dying patriot Caesar Rodney. Carolyn Saxon does a fine job portraying Abigail Adams’ faraway longing for her absent mate while Cheryl D. Singleton is a stately, dignified, and wise John Hancock, president of Congress. Luis Negron is strong as harried Congressional secretary Charles Thomson and Ricardo Holquin effectively portrays the waffling James Wilson of Pennsylvania, whose last-minute decision to change his vote actually brought the new nation into existence. The costumes by Rachel Padula-Shufelt have had one foot in today and another in the Colonial era, with some Colonial-era elements combined with more modern wear. I actually felt bad for Evett attired in what appeared to be uncomfortable skin-tight leather pants, doffing his waistcoat to reveal his pin-striped sleveless jacket. They didn’t scream statesman to me. There were other small but off-putting touches that were just too cute and detracted from the production, such as one member of Congress playing with appeared to be a slinky, or the ever-voracious Samuel Chase of Maryland (Jane Reagan) devouring a takeout container of Chinese food. If you are trying to set a mood or tone for the production, are they helpful? Ideally, a large-scale musical deserves more than the seven piece orchestra led by the capable Todd C. Gordon, but the 339-seat capacity of the Mosesian Center and the simple economics of a large cast are stacked against it. There’s something lost, especially when certain numbers – such as “Molasses to Rum” – reach a crescendo. “1776” is a great show. The current production at New Rep doesn’t change that, even if one were to question some of the casting choices or decisions made, say, regarding costumes or Chinese food.